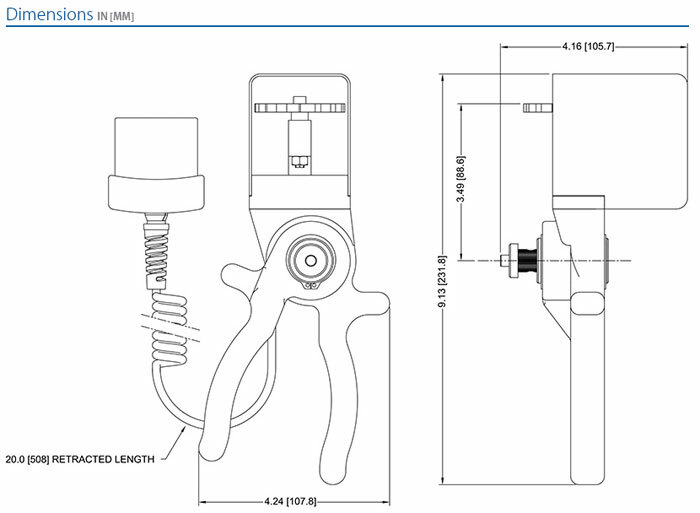 The MR06-200 wire crimp pull sensor is a hand-operated solution for measuring wire crimp pull-off forces. The ergonomic handles and convenient tensioning mechanism make field measurements a breeze for applications up to 200 lbF (1,000 N). Squeeze the handles together to increase tension on the sample until a break occurs. The peak force is recorded by a Mark-10 indicator. 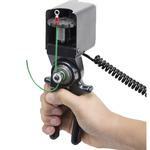 The MR06-200 wire crimp pull sensor is a hand-operated solution for measuring wire crimp pull-off forces. The ergonomic handles and convenient tensioning mechanism make field measurements a breeze for applications up to 200 lbF (1,000 N). Squeeze the handles together to increase tension on the sample until a break occurs. The peak force is recorded by the indicator. A rotating turret with slots of multiple sizes accommodates a wide range of wire diamaters, up to 0.25 in. (6.4 mm). Unique Plug & TestTM technology allows for interchangeable sensors to be used with a Mark- 10 indicator. All calibration and configuration data is saved in the smart connector.